We’d love your help. 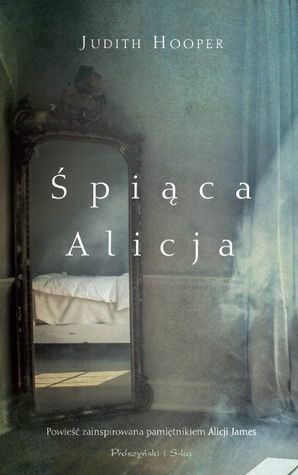 Let us know what’s wrong with this preview of Śpiąca Alicja by Judith Hooper. "Szykujcie oręż przeciw memu zaraniu, które lada chwila strąci Ciebie i Harry’ego w mroki zapomnienia", napisała Alicja do swojego brata Williama w 1891 roku. Nie zdążyła, zmarła kilka miesięcy później w wieku czterdziestu trzech lat. Kim była? Młodszą siostrą Henry’ego, sławnego pisarza, autora „Bostończyków”, „Portretu damy” i „Domu na placu Waszyngtona” oraz Williama, w "Szykujcie oręż przeciw memu zaraniu, które lada chwila strąci Ciebie i Harry’ego w mroki zapomnienia", napisała Alicja do swojego brata Williama w 1891 roku. Nie zdążyła, zmarła kilka miesięcy później w wieku czterdziestu trzech lat. Czytając druzgocące analizy postaci w „Of Moths and Men”, byłem przekonany, że talent tej cudownie inteligentnej pisarki sprawdzi się także w beletrystyce. „Śpiąca Alicja” potwierdziła moje przewidywania. Jako pisarz czuję się podwójnie nagrodzony. Po pierwsze, mogłem przeczytać absolutnie wspaniałą powieść, przemawiającą ostrym, bezlitosnym głosem Alicji. Po drugie, jedna z moich najzdolniejszych konkurentek odeszła z gry. Ostatnie zdanie jest żartem. Ale cała reszta to szczera prawda. Judith Hooper jest doskonałą pisarką w każdym gatunku. W debiutanckiej powieści „Śpiąca Alicja” Judith Hooper przedstawia bogaty, sugestywny i zuchwale intymny portret Alicji James, inspirującej w swoim heroizmie. Bohaterka jest kimś znacznie więcej aniżeli cierpiącą inwalidką, to silna, odważna i samodzielna artystka, która w pełni zasługuje na uznanie jej za pełnoprawnego członka słynnego literackiego klanu Jamesów. Dzieło zapierającej dech w piersiach wyobraźni. W postaci wybitnej pamiętnikarki, jaką była Alicja James, Hooper pokazuje nam osobę zuchwale ciekawą, niepokornie oryginalną, dorównującą pod każdym względem wybitnym braciom, Henry’emu i Williamowi. Klan Jamesów słynął z ekscentryczności nawet w Bostonie, a więź między rodzeństwem została tu pokazana jako czuła, trwała oraz pełna humoru. Niezwykłe osiągnięcie literackie, porywająca lektura. To ask other readers questions about Śpiąca Alicja, please sign up. 3.5 For her first foray into fiction, non fiction writer Hooper has tackled the insular and well known James family. Narrated by Alice as she attempts to recover from her latest malady at a spa in England, she takes us back and forth into her life as the youngest and only daughter. Plagued most of her life by various ills, an intelligent woman with few outlets, her life is a matter of intellect, always yearning for the freedoms allowed her bothers. In the days before any effective medical treatm 3.5 For her first foray into fiction, non fiction writer Hooper has tackled the insular and well known James family. Narrated by Alice as she attempts to recover from her latest malady at a spa in England, she takes us back and forth into her life as the youngest and only daughter. Plagued most of her life by various ills, an intelligent woman with few outlets, her life is a matter of intellect, always yearning for the freedoms allowed her bothers. In the days before any effective medical treatments, rest cures, mesmerism and as a last resort, institutions were all that were offered. Tonics and supposed medicines contained poisons that taxed an already unhealthy disposition. Many of the James letters from Henry and William are quoted, their love for their sister evident. Yet, they too suffered from undiagnosed illnesses, mental and physical, took to sanitariums and looked for answers in other ways. Yet, they became successful, even if plagued by demons. Well written, introspective, a fascinating look at a family that still influence many today. All the famous people they met, their lives and philosophical debates, a book that will prove fascinating for those interested in this family. The author at the end attempts in todays better understood psychiatric diagnoses, to understand the many causes of this family's ills, this family, things that ran in the family bloodline. I found this book delightful. An historical fiction of Alice James. I was totally unaware of this woman until reading this book and hope that I can find a copy of her diary that was published many years after her death. This book showed to me the plight of women in the late 19th century, the life of privileged and a glimpse at so much more. The descriptive writing I found beautiful. The James's family is displayed with all its worts and beauty. Inherited wealth allows them to live an extraord I found this book delightful. An historical fiction of Alice James. I was totally unaware of this woman until reading this book and hope that I can find a copy of her diary that was published many years after her death. The James's family is displayed with all its worts and beauty. Inherited wealth allows them to live an extraordinary life with little thought to their good fortune. Alice, subject to mysterious illnesses from an early age finds her true self later in life. She becomes bedridden and begins to write her journals that reveals her life. This is Judith Hooper's first work of fiction and I hope she writes more. It is difficult without reading Alices actual diary to know how much is Alice's and how much is Ms Hooper's. Based on the diary of Alice James and correspondence between Alice and the rest of the James's family I found Judith Hooper's Alice In Bed to be an utterly fascinating and compelling novel. We meet Alice, daughter of the famous author Henry James, in her late 30's during the latest bout of illness which has rendered her bedridden. Similar episodes of illness have plagued Alice since she was young and no one has been able to diagnose what is wrong with her. During this episode of incapacitation Al Based on the diary of Alice James and correspondence between Alice and the rest of the James's family I found Judith Hooper's Alice In Bed to be an utterly fascinating and compelling novel. We meet Alice, daughter of the famous author Henry James, in her late 30's during the latest bout of illness which has rendered her bedridden. Similar episodes of illness have plagued Alice since she was young and no one has been able to diagnose what is wrong with her. During this episode of incapacitation Alice reminisces about her life, friendships, family, and lovers, giving the reader a glimpse into the private lives of this often amusing, intelligent but ultimately tragic family. I was particularly fascinated by Alice's relationships with her cousin Sara, and Katherine Loring with whom she formed intensely passionate affairs. The emotions and subsequent sexual encounters, particularly relating to the former friendship, were a revelation to Alice, but also confusing especially as the relationship was not on equal footing. Alice comes across in Hooper's novel as a highly intelligent, quick witted, articulate young woman, who inside the family, is encouraged to participate in stimulating conversation and argument with her brothers and father on a multitude of topics. However outside of the family her spirited enthusiasm to engage fully in life's experiences is deemed unnatural, and inappropriate behaviour for a young lady. There was so much that I enjoyed about the book; the prose was exquisite, and entirely in keeping with the period. My reading copy is full of highlighted text, sentences and paragraphs of beautifully written descriptions of the conversations and acerbic quips between the members of the family. I spent hours looking up words in a dictionary and although I do recognise that this may be a drawback for some readers, I found it enlightening. Alice In Bed is an intelligent thought provoking, cleverly imagined life of Alice James and one which I recommend unreservedly to anyone interested in American literature, and the lives of privileged women living during this era. It would be an ideal choice for book reading groups as I'm sure it would generate a lot of debate and interesting discussion. This is a novel treatment about Alice James and her eccentric family which included her brother the author Henry James. It is well written. Didn't have many complaints. Although her brothers Henry and William are better known, Alice James was a fascinating person in her own right. In Alice in Bed author Judith Hooper makes her first foray into fiction by drawing extensively on her experience writing non-fiction. The result is a hybrid work that uses historical fact to inform the fictional accounts of the less covered sister of the James family. Hooper mixes actual correspondence between the family members and snippets of Alice's diary with her own speculations Although her brothers Henry and William are better known, Alice James was a fascinating person in her own right. In Alice in Bed author Judith Hooper makes her first foray into fiction by drawing extensively on her experience writing non-fiction. The result is a hybrid work that uses historical fact to inform the fictional accounts of the less covered sister of the James family. Hooper mixes actual correspondence between the family members and snippets of Alice's diary with her own speculations to form a fairly cohesive portrait of the intelligent and elusive Alice. In this book you travel from London to Paris and back to Boston, following the correspondence between all the James children and the ailments they all face. Written in an era where mental illnesses are treated with vacations to mountain resorts to soak in warm baths, or the dreaded alternative of a sanitarium you learn about the dark treatments used on patients like Alice who merely suffer from generalized anxiety. As it turns out, the Jameses were a prominent Boston family in the 1890s with an eccentric father who had a tendency to shut himself up in his office to write about “Divine Nature” and other supernatural occurrences. The story centers around a young woman by the name of Alice who suffers from ailments that no doctor of “modern” medicine can diagnose. It follows Alice’s suffering and the impact it has on her family, her friends and her dreams. As her suffering progresses to her legs, she finds herself bound to a chair and at the mercy of her nurse – her only consolation from her life of isolation is the occasional letter she receives from her brothers and cousins living their lives around the world. Despite her physical ailments, Alice is of sound mind, she’s sharp witted, highly independent in thought and very opinionated. With her charm and her sharp mind for politics she makes friends easily. She shocks high society with her feminist beliefs and your heart breaks for her as her body slowly fails her all due to mental health. Alice James dotes on her brothers William and Henry and not just because of their literary talents. The James family headed by Henry James Senior who, since his Vastation, has imagined his own religion "so exclusive it has only one member." Alice's friend Sara (of the Emerald Nights) early on says, "Ye gods! The way your Father talks!" The head of the household writes books and letters Alice can't comprehend, but in Cambridge his lectures are popular. Letters between family members are worth read Alice James dotes on her brothers William and Henry and not just because of their literary talents. The James family headed by Henry James Senior who, since his Vastation, has imagined his own religion "so exclusive it has only one member." Alice's friend Sara (of the Emerald Nights) early on says, "Ye gods! The way your Father talks!" The head of the household writes books and letters Alice can't comprehend, but in Cambridge his lectures are popular. Letters between family members are worth reading on their own, but it the voice of Alice, who has become an invalid, that makes this novel spectacular. The youngest child of parents whose "affectionate absorption in their five children was almost legendary," Alice struggles with her place in the world. "Why was I required to be interested in these domestic details, while Harry was assumed to have better things to do? ... He wore trousers and I a skirt." In the late 1800s these values were little questioned. Her father says to her, "Well, Alice, you know what Dr. Johnson said about women preaching. It is like a dog walking on its hind legs. It is not done well but you are surprised that it is done at all." Dinner table discussions in the James household is almost a contact sport. Alice is not expected to contribute strong opinions, but when she forgets herself and blurts out her thoughts, her senses felt keenly alive as if she were a wild animal in the forest. Quotable on every page, Alice James is a woman I'm glad to have gotten to know in this remarkable story. This book was a delightful read. I do confess that my head fell over a couple of times, but i think it was more that it was bedtime than boretime. It's very dry which is one of my favorite kinds of reading and listening, so you have to pay attention. If we tend to forget how women were not respected and how they had to wear corsets so they couldn't breathe (thus fainting) and how health care was non-existent--then this book is your next read. i liked the short letters in between chapters. It's a This book was a delightful read. I do confess that my head fell over a couple of times, but i think it was more that it was bedtime than boretime. It's very dry which is one of my favorite kinds of reading and listening, so you have to pay attention. If we tend to forget how women were not respected and how they had to wear corsets so they couldn't breathe (thus fainting) and how health care was non-existent--then this book is your next read. i liked the short letters in between chapters. It's another reminder of how times have changed. People don't write letters, we send texts and emails. The composition of a letter took a lot of thought and care, and most importantly, the letters survive. Whatever was wrong with Alice is still a mystery, although it is suggested that it was psychosomatic. I was thinking it was MS or something related. What a sad life! This feminist novel about Alice James, younger sister to William & Henry James (& two other brothers), draws from and quotes regularly from the James’ correspondence and other private writings. Clearly, Alice was brilliant intellectually and was respected by her brothers; her wit & humor (the novel is written in her first-person voice) is what kept me reading even though the whole family’s obsessions with their physical, mental, & emotional health wore thin for me, as did all the This feminist novel about Alice James, younger sister to William & Henry James (& two other brothers), draws from and quotes regularly from the James’ correspondence and other private writings. Clearly, Alice was brilliant intellectually and was respected by her brothers; her wit & humor (the novel is written in her first-person voice) is what kept me reading even though the whole family’s obsessions with their physical, mental, & emotional health wore thin for me, as did all the name dropping. Maybe if I knew more about the various members of the Boston intelligentsia in the last half of the 19th century, I would have appreciated this last aspect more. (I would recognize names but know very little about them.) Although it had its moments, all in all, this was a slog for me. 4.5 I found this hard to put down. I particularly loved the end piece where the author speculates on Alice's physical and psychological states in modern terms. I was never required to read any Henry James fiction in school. I did try Turn of the Screw recently (not finished) and I think I've picked up some of the novels. But I have the strong sense that this author is holding information over my head, taunting me with the sense that I will never get the joke. Terrific - made me read The Diary of Alice James. Judith Hooper makes her come to life! Alice in Bed is a beautifully written, somewhat meandering novel that puts the reader into the head of Alice James, through her diary entries, letters, and relationships with her family, friends and lovers. I confess that I knew virtually nothing about Alice James before reading this book, having some familiarity with her two famous brothers, author Henry James and psychologist and philosopher William James (and most of that sketchy knowledge of the James brothers came from various lit and psych Alice in Bed is a beautifully written, somewhat meandering novel that puts the reader into the head of Alice James, through her diary entries, letters, and relationships with her family, friends and lovers. I confess that I knew virtually nothing about Alice James before reading this book, having some familiarity with her two famous brothers, author Henry James and psychologist and philosopher William James (and most of that sketchy knowledge of the James brothers came from various lit and psych classes many years ago). I was pulled to the book through the description and the thought of what life would be like for a woman in the late 1800s--already sidelined and compartmentalized due to gender--who is bedridden with a mysterious aliment (or ailments). Alice is quite a character right from the start, full of wit and intelligence and unfortunately also full of the family leanings toward depression, manic behavior, and various other physical and mental maladies. Alice chafes against the treatment of women and the role of dutiful daughter and caregiver she is placed in as much as the chafing of the corsets she is expected to wear. In addition to having little outlet beyond family dinners and conversations to use her mind, her lack of general health and vitality and her attraction to females rather than men all make life a challenge even before her illness and inability to walk begins. It's easy to admire her and to wonder what she could have done living in another time and place where she would have had more freedom, options, better health care, and a chance for more than a "female hysteria" diagnosis or the other strange conditions she was thought to have. Although we will never know exactly what led to Alice's illnesses, the author does provide an interesting afterword, "What was wrong with Alice James?" that discusses possible reasons for her health issues. I did find Alice in Bed challenging to get through it at times. I think it was as much or more of a case of right book, not-quite-right-time for me than it is any criticism of the writing. I have had a couple of extremely busy weeks where reading could only happen in small, late evening bursts and this books needs and deserves more attention than I was giving it--it is not a quick and easy read. I struggled through the first two-thirds before getting some dedicated 'quiet time' this weekend to finish it up and found that when I could sit and really absorb what I was reading, my enjoyment of the story was tenfold. Author Hopper makes the period, setting, and characters come alive in such a way, that I had to frequently remind myself it was a novel. Sad in places, but sharply funny in others, Alice in Bed is a great pick if you like strong female characters, history, and intimate character studies, Just be sure to give yourself plenty of time to savor the story. This was an interesting bit of historical fiction, attempting to illuminate Alice James, the sister of psychologist William James and novelist Henry James. Alice, despite being the youngest child, female, and chronically ill, was witty in her own right, and was made posthumously famous through the publishing of her diary. Through the snippets of letters sent between her brothers, her parents, and herself, in addition to some excerpts from her diary, we are given the non-fiction parts of this stor This was an interesting bit of historical fiction, attempting to illuminate Alice James, the sister of psychologist William James and novelist Henry James. Alice, despite being the youngest child, female, and chronically ill, was witty in her own right, and was made posthumously famous through the publishing of her diary. Through the snippets of letters sent between her brothers, her parents, and herself, in addition to some excerpts from her diary, we are given the non-fiction parts of this story. The rest of it, told with Alice as narrator, is more speculation, since the real Alice James was chronically ill and unable to leave her bed - and, more significantly, was encouraged to be invisible, since this was the 19th century. I think Judith Hooper did well in creating a realistic person out of the material she had to work with. I can easily imagine a brilliant woman, with two intelligent brothers, being frustrated at being forced in a box she didn't feel like she fit into. (view spoiler)[I can even understand the lesbian undertones, as Katherine Loring was the person closest to Alice when she died, and was presumably given Alice's diary and told, at Alice's request to publish it. Although I have to say it seems like lately historical fiction likes to make their strong female characters also lesbians... as though intelligence and homosexuality must occur together and you can't just be, I don't know... smart and asexual, or smart and free-spirited? (hide spoiler)] I also felt like she captured the mindset of a chronically ill person in those days - before you had the technology to remain connected, the world must have gotten very small indeed if you were confined to your bed and talking to only those few people who came to visit. Still, I didn't love this. Oh, I liked it, sure - the subject matter was interesting. The characters just didn't seem fully realized to me - even Alice felt a little like she was holding something back. The dialogue was occasionally witty but a lot of times felt dry, too. No one really sprung off the page to make the world seem that much more real. History enthusiasts, especially early American ones, will likely love this. I appreciated the window into the past, but I don't feel like I really learned anything new. For that, I'll give it an average 3 stars. One of Alice’s brothers is William James, one of the greatest English novelists of the time; another is Henry James, who is inventing American psychology. The Jame ALICE in BED (Counterpoint) by Judith Hooper takes readers to Boston and England in the mid-late 1800s – a challenging time, for intelligent women. Unfortunately they find themselves, as in the case of Alice James, repeatedly coming up against walls and closed doors in a society with no opportunity for women to further their education. "Alice in Bed" is the story of Alice James, the sister of Henry and William James. Both of the brothers are well known for their contributions to literature and psychology. This book seeks to give a voice to Alice, whose own legacy has been largely overshadowed by her brothers. She is absolutely fascinating as well. I love historical fiction that gives voice to those who may be almost lost to history as Alice is. This is a fascinating portrait of a person that I was not at all familiar with befo "Alice in Bed" is the story of Alice James, the sister of Henry and William James. Both of the brothers are well known for their contributions to literature and psychology. This book seeks to give a voice to Alice, whose own legacy has been largely overshadowed by her brothers. She is absolutely fascinating as well. I love historical fiction that gives voice to those who may be almost lost to history as Alice is. This is a fascinating portrait of a person that I was not at all familiar with before. Alice's family is well known in the social circles of Boston. The author draws a lot on the personal letters and writing of the various characters in order to bring them to life. I especially like how the author was able to capture Alice's quick wit and sharpness throughout the book. The author captures her innermost thoughts. Alice suffers from many health issues throughout the book and it was so interesting to see how this affects the way that she sees the world. I really feel like I got to know her through this book. If you like vivid characters, Alice is for you! I thought this would be a stimulating glimpse into the intellectual James family, and to a degree it was. Brothers William and Henry, the renowned psychiatrist and author, respectively, and their sister Alice are all extremely philosophic, but I didn’t get a sense for what drove them to pursue their ambitions. The first half of the novel seemed to be a combination of name-dropping Bostonian socialites and Alice’s foray into lesbian sensuality. The second half is her laid up with her various un-d I thought this would be a stimulating glimpse into the intellectual James family, and to a degree it was. Brothers William and Henry, the renowned psychiatrist and author, respectively, and their sister Alice are all extremely philosophic, but I didn’t get a sense for what drove them to pursue their ambitions. The first half of the novel seemed to be a combination of name-dropping Bostonian socialites and Alice’s foray into lesbian sensuality. The second half is her laid up with her various un-diagnosable maladies (melancholia, nerves, gout, et al). She does a lot of pondering as an invalid, whether it’s mentally debating women’s suffrage and their suppression, her past relationships (possibly a traumatic molestation? ), or her unusual relationship with her brothers (incestual implications?). It really all boils down to the whole James lot being somewhat mentally imbalanced. While it was a decent portrayal of the limits of women during the latter half of the 19th century, it wasn’t necessarily an exciting narrative. I received a complimentary copy of this book via TLC Book Tours. This is an imaginative and witty account of Alice James not just as the invalid sister of her famous brothers. Hooper depicts Alice as passionate, mischievous, intellectual and thoughtful. She is full of ideas and full of life. This a slowly paced novel that reveals much about the James family and their peers as well as the historical era as these were things Alice cared very much about. The dialogue is realistic and the letters included at the end of chapters provide a nice summary of the famil This is an imaginative and witty account of Alice James not just as the invalid sister of her famous brothers. Hooper depicts Alice as passionate, mischievous, intellectual and thoughtful. She is full of ideas and full of life. This a slowly paced novel that reveals much about the James family and their peers as well as the historical era as these were things Alice cared very much about. The dialogue is realistic and the letters included at the end of chapters provide a nice summary of the family happenings and climate. Obviously well researched, Hooper' s crossover to fiction is a success. Read in conjuncture with The Master...interesting take on the James Family.....limited choices for women of this period...The Master was more complete and revealed a lot about the effect of the civil war on families, the double standard of an intellectual family, limited options for young woman, mental illness and repressed sexuality during the Victorian period. I suppose that the text in italics in "Alice" were direct quotes from her diary but wondered how much here was invented....The Master fe Read in conjuncture with The Master...interesting take on the James Family.....limited choices for women of this period...The Master was more complete and revealed a lot about the effect of the civil war on families, the double standard of an intellectual family, limited options for young woman, mental illness and repressed sexuality during the Victorian period. I suppose that the text in italics in "Alice" were direct quotes from her diary but wondered how much here was invented....The Master felt more scholarly .....a sad comment that bright young woman of the time used invalidism to avoid the strictures of family life. Five stars from me means the book is a "hit" and definitely worth reading. I went to a book talk given by the author and it was her wonderful sense of humor when describing Alice that made me want to read it. I wasn't disappointed. In fact, I loved it and recommended it to tons of my friends who also loved it. You can't beat historical fiction written by someone who has a sense of humor. Next on my list (well, eventually, is The Master, a book written by C. Toibin about Alice's brother, Henry). This is a well written novel about diarist Alice James, sister of author Henry and philosopher William. Her eccentric Boston family of intellectuals is fodder for her memories. She sees and records the reality of life in this family in the 1800s. Alice spent the last years of her life in bed, but she wasn't boring. This is a great book for those of you who like 'biographies', eccentricity and life in the closed world of 1800 Boston intellectuals. The author Based this book on Alice James's diary and the letters between Alice and her brothers. I thought it was done so very well. Poor Alice was as intelligent as the rest of the family but, due to the times, was stifled and unable to do anything with her intellect outside the family. Very good book. Alice in Bed is a fascinating portrayal of Boston in the 1800's and one of America's leading intellectual famiilies. It is also filled with wit and humor, as Alice observes the stuffy social rituals and pompous academics around her. Beautifully written, this book is one that I couldn't put down, right up to its extremely moving final chapters. Ms. Hooper has brought to life a brilliant, complicated and modern woman trapped in the late 1800s. Somehow, the author has created such a complete portrait of Alice James it is hard to imagine it is a work of fiction rather than autobiography. The scholarship involved and the bright, fresh prose make the book a delight to read. I can't wait for Ms. Hooper's next book. Alice may have spent most of her last years in bed, but her mind went everywhere. I loved seeing the world of Henry James from the point of view of Alice, his sister. Fascinating, too, how many of her observations and insights made it into his books. Although it's a novel, it reads like a memoir--the best of both worlds. Very interesting, although it did lag for me - maybe because some of the comments were over my head or maybe because Alice and the rest of the James family became overwhelming.